Direct Ocean Front Luxury Condo - Grote 3 slaapkamers 3 badkamers. Beste beschikbare prijzen. Groot (1990 vierkante meter), direct oceaan, op de zesde verdieping unit met balkon vanuit de woonkamer en de luxe master suite. Vernieuwde badkamers om nieuwe armaturen, keramische tegels en granieten werkbladen bevatten. Ook vernieuwde keuken met nieuwe kasten en granieten werkbladen. Fantastische oceaan en de rivier uitzicht vanuit dit einde eenheid. Gebouw heeft een oefening faciliteit met een sauna. Beveiligd gebouw met parkeergarage. Grote formele eethoek en een grote ontbijttafel. TV in elke slaapkamer. Prachtige decor en meubilair. Dit toestel heeft het allemaal. Voorzieningen :: Telefoon, Airconditioning, Kabel-TV (4), Stereo, volledige keuken, magnetron, vaatwasser, koelkast, kookgerei voorzien, handdoeken inbegrepen, wasmachine en droger, Sauna, Privé Zwembad, Garage. Complementaire Wi-Fi in de eenheid. Tennis en basketbal zijn ter plaatse gevestigd. In de buurt van alle belangrijke bezienswaardigheden. Badkamers zijn onlangs gerenoveerd met nieuwe armaturen, keramische tegels en granieten werkbladen bevatten. voorzieningen Airconditioning, Kabel TV, videorecorder, Stereo, volledige keuken, magnetron, afwasmachine, koelkast, ijsblokjesmachine, keukengerei geleverd, handdoeken inbegrepen, sauna, zwembad (gedeeld), niet roken. De wasmachine en droger bevinden zich in de unit. Gratis Wi-Fi in de unit. Activiteiten en attracties Fietsen, Golf, Tennis, Basketball, Fitnessruimte, Shuffleboard, Minigolf, Pretparken, Vissen, Winkelen, Restaurants, Bioscopen, Musea, Sightseeing, Zwemmen, Snorkelen / Duiken, Roeien, Zeilen, Waterskiën, Surfen, Windsurfen, Parasailing, Jet Skiën, beschietingen Tennis- en basketbalvelden bevinden zich op het terrein. Dichtbij alle belangrijke bezienswaardigheden. This unit was wonderful! It was so clean and had everything we needed. The view is amazing! I would definitely stay here again. The condo was just as we had hoped. We had a family vacation with our adult children and grandchildren. It worked perfectly for us! The kids are already talking about a return trip here! A wonderful relaxing care-free vacation. We have been renting this condo for many years. It has become our home away from home for our family for one care free week during the summer. The condo is always clean when we arrive. Fresh linens are on the beds and clean towels hung on the towel bars. Plenty of extra towels and bed linens are supplied, the kitchen is well stocked with pots, pans, dishes etc. We only have to unload our suitcases and make a trip to the grocery store. Every year we get a call from the owner to make sure every thing is OK and to let us know they are only a phone call away. We have been coming to Daytona Beach since our oldest grandson started walking (he is 13 years old now.) This condo is by far the most comfortable accommodations we have found. We take time out of our hectic lives to play on the beach for a week just to enjoy our children and grandchildren. I highly recommend this condo. Our whole family loves it. Try it , you will love it too. 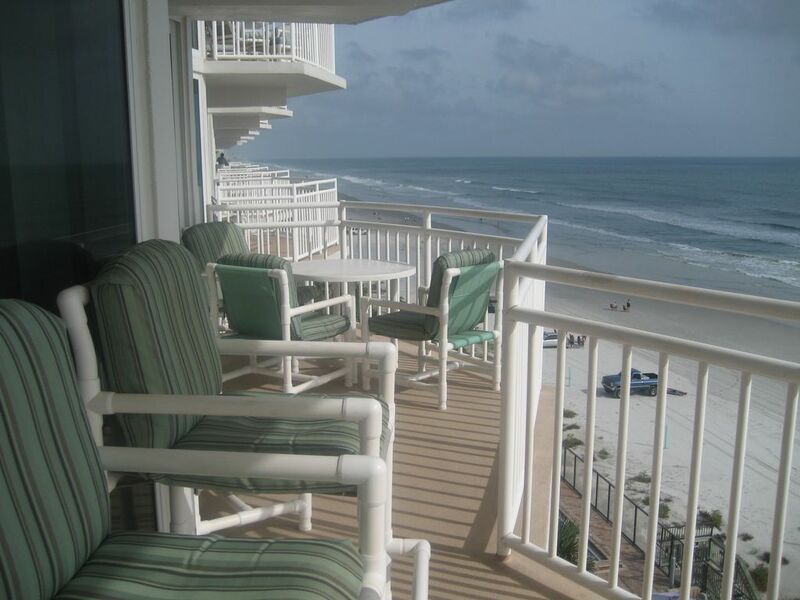 Beautiful, updated, beach front condo! Our second time staying in this condo. Clean, nicely decorated and is exactly as described. Outstanding view of the beach and ocean from the living room, dining room and Master bedroom. Photos are current. Very easy process to rent the condo and to check in. Owner called to check on us soon after we arrived. Beautiful, safe area, in convenient location. Loved the place and look forward to staying again. We are lucky to have return guests like you and Thank you for your time and review. It is important for us to keep our websites current so their are no surprises upon your arrival. We look forward to welcoming you again soon. One of the best vacations of all time !!! One of the besr vscations of all times for my family. Fun and relaxing away from the city but close enough for the teens to still get there city time in..... Everything in the condo was perfect very clean with all the items you need in a home away from home and more! Thank you for sharing your home . Would highly recommend my family wants to go make it our stay every spring break now. The confenience to Ponce Inlet was our main interest. Thank you for your sharing your experience with us. Sounds like the entire family was happy. We look forward on sharing our home for your future family vacations. We are glad the unit met all your expectations; cleanliness, the comforts of home, and great location. Your recommendation of referrals is the greatest compliment. The condo was clean and nicely furnished. My family and I felt at home here. Wait time for elevator was extremely long as there was only one working. Being a three bedroom unit two keys would have been nice to have. Would recommend this property. Thank you for sharing your vacation experience. We are glad you felt at home at our condo. That is one thing we strive for, for our renters. The the elevators our not in our control, but we do apologize for the delay. We understand that you have better things to do with your time on vacation! We look forward to your return for your next vacation. Daytona Beach en Daytona Beach Shores zijn erg ontspannend gemeenschappen met diverse speciale evenementen het hele jaar lang. Sommige van onze meer bekende evenementen zijn de NASCAR gebeurtenissen in de speedway, Bike Week maart, Biketoberfest is in oktober, Spring Break, en gewoon plezier in de zon op het strand! Golf: Er zijn vele golfbanen in en rond de Daytona Beach gebied.